Not sure of what to gift your friend or a family member during the festive season. Give them the joy of riding for free with Uber. Use your invite code and give them a free first Uber ride. The interesting part of this offer is you can also enjoy a free ride when your friend uses the ride. So, gift all your friends the free Uber rides and get ready to enjoy unlimited free rides. Download the Uber cab app if you are new to Uber. Refer family members or friends using the invite code. You can obtain your invite code from the Free Rides section of your app. Friends can avail the free ride when they sign up to Uber using your invite code. You will obtain the free ride Uber voucher when your friend takes the free ride. Refer more friends and ride for free. This offer is valid in all Indian cities except Chandigarh, Kolkata, and Chennai. Similar to Uber, Ola also covers major cities for traveling and reaching the destinations. Look into Ola Cabs Coupons to avail some excellent deals while you travel around your destination city. Uber services were initially launched in Bangalore and later expanded to other metropolitan cities such as Mumbai, Delhi, Hyderabad, Chennai, Kolkata, Pune, Ahmedabad and Jaipur. Currently, Uber operates in 22 Indian cities. The offer is subject to few conditions. Your account is subject to suspension if Uber identifies the free rides are earned wrongly. Uber checks the sign-ups that are obtained through your invite codes. Make sure that your friend takes the free ride within the period specified by Uber. Uber referral program enables existing users to continue winning their Uber free rides. Just refer a friend to grab Uber 600 referral offer. Refer as many friends as you have and enjoy more free rides for every successful referral. Keep referring and continue earning. Pros: User Friendly Mobile Application easy to book a cab. Cons: Many Of The Cab Drivers are not Professional. Uber committed to serving the community that gave it an opportunity to grow splendidly partnered with Estee Lauder Companies for illuminating the sea link in Mumbai between Bandra and Worli in pink. This initiative aims to stress the importance of detecting the breast cancer at an early stage. With Uber Approved offer, you can get exciting offers at chosen restaurants, lifestyle stores, and bars. Just take a Uber ride to the specified stores and provide the Uber receipt to get the offers. If you forgot the receipt, check the promo code provided with the offer and provide the code to be eligible for the exciting offers. So, hurry up and enjoy shopping at discounted prices or get a shot at your favorite restaurants and bar. Restaurants and bars partnering with Uber include Yauatcha, Hakkasan, The White Owl, PDT, The Gourmet Box, and others. Don’t go on a hunger strike when you are traveling in Mumbai. Order your favourite or Mumbai’s famous food right where you are on Swiggy Mumbai offers. Eat heavenly and save largely with Swiggy! Lifestyle stores partnering with Uber include India Circus, My Glamm, Nykaa.com and others. New users to Uber have to download the application. Open the application and tap on the promotions page to get the free ride promo code. Give the promo code at the time of requesting the ride to avail the free ride offer. Uber which is offering lowest fares compared to other cab services in Mumbai is offering a first free ride worth Rs.200 for new users. Book a cab and you can immediately get a rough estimate of the fare. Just like Uber, you can also find exciting deals on Ola First ride Mumbai for all the new users. For rides exceeding Rs.200, the balance amount will be charged to the credit card specified during registration. The festive season is the time to have fun dining with friends and family members. Uber offered free rides to Mohammed Ali Road during the EID to give its riders an opportunity to have food at best restaurants. It should be noted that each user gets a single chance to enjoy the free ride. Hence, do not make mistakes while providing the pickup location. Pros: You Can also Pay The Cash to Driver by Hand. Uber launched its services in New Delhi in June 2014. UberX, UberGo, and UberXL services are available in New Delhi. Here is a list of offers available for Delhi Uber riders. Uber announces the great giveaway offer for Delhi riders giving them an opportunity to win the free ride for one whole month. Availing this offer is very simple. Take paid rides during the period specified by Uber and get a chance to win the free ride. For every two paid rides taken during the specified period, the rider gets a chance to win the Uber free month offer. Apart from the Uber month offer, few riders will be given a chance to ride free for two weeks. you can find such offers at a different place as well. Meru Cabs Delhi offers is also giving similar offers for all the travelers visiting Delhi! So, keep checking Uber giveaway offers to grab your chance of winning Uber month. Celebrating the inauguration of UberXL services in Delhi, Uber is offering a free UberXL ride for new users. Travel with your family luxuriously without worrying about extra space for luggage or arrive at a party with group comfortably. Uber started UberXL services in Delhi from November 2nd. UberXL range of cars includes Toyota Innova, Maruti Suzuki Ertiga’s. UberXL rates are fixed at a base fare of Rs.85 plus Rs.12 per kilometer with waiting charge of Rs.1.50 per minute. The minimum charge to be paid for the UberXL ride is Rs.125. The split fare feature allows you to share Uber fare with your friends. The fare can be split in four ways, five ways, and six ways. So, enjoy traveling together and save on your ride fare. New users can get a UberXL free ride. To get the free ride give the Uber free ride promo code while placing the request for a cab. Download the Uber application from Google PlayStore, Apple Store and Windows to register with Uber. Set the pick-up location, give the Uber free ride coupon code, and request the UberXL ride. Get a ride to enjoy the luxurious ride with your friends or family members. The weekend is the time to have fun dining with friends or enjoy wonderful music concerts. Uber partners with the some of the most visited restaurants and pubs to give its riders a chance to enjoy free drinks over the weekend when they ride to the spot with Uber. It even makes a check of the celebrations and movies, over the weekend and gives riders a chance to get the tickets for the event at discounted price. You can get discounts on your movie tickets as you use BookMyShow for booking. Also get notified from Uber for your pickup time, so that you don’t miss the beginning of your movie! Check the promotions page of your app to know the offers available over the weekend. It should be noted that weekend offers at Uber partnering locations can be availed only by providing the Uber receipt. To reduce the pollution and the traffic on roads, Gurgaon’s traffic authorities have initiated the No car day concept encouraging the riders to use public transportation and reduce the number of cars on the road. With Uber, you can follow the no car day without the hassles of riding in metros and buses. That’s right, ride with your friends with Uber, split fares and get your ride at a very low price. UberGo services in Delhi are the cheapest of all the Uber services available in Delhi. UberGo range of cars includes vehicles such as Ritz, Liva, Swift, Ecco, Indigo CS, and Wagon R which can accommodate 4 passengers. UberGo services in Delhi are priced at a base fare of Rs.40 plus Rs.7 per kilometer with waiting charges of Rs.1 per minute. By using UberGo service, you can split the fare four ways and pay a very low fare for your ride. So, stop driving on Tuesdays and enjoy the Uber ride at a low price. For any queries related to Uber Delhi offers call Uber Delhi number to get more information. Halloween is time to have fun with scary ghosts. Double your fun with Uber Halloween offers. Uber offers interesting offers on special occasions such as Halloween in association with its partners. Save on your couples tickets or group tickets at Hauz Khas Village or Connaught Place. Give the Uber coupons code and enjoy the scary evening for a low price. Get a free shot at Sutra Gastropub by providing Uber ride receipt at the pub. Only those aged 25 and above can avail the offer at the pub. To avail the offers, it is required to provide the Uber receipt at the time placing the order. If you are an existing user and you are looking for some excellent offers for your next use, you can try it on Ola Existing User coupons Delhi Users! This offer should not be used along with other offers. Pros: Fares are Cheaper Compared to Other Cab Services. Cons: Uber is Not Allowed to Book Cabs in Many Airports. Uber launched its services in Bangalore in June 2014. Uber services are available in Bangalore from all popular landmarks, shopping malls, and cultural centers. Uber Rides are available within the city limits covering Kempa Lingapura, BLR Airport, Thirumalashettyhally, Bommasandra, Nice Toll Plaza, and Madavara Gram Panchayat. Save on your fun trip to Wonderla with Uber app offer. Uber is offering standard rates in Bangalore to Wonderla. Wherever you stay in Bangalore your trip to Wonderla costs the same. UberGo is available at Rs.650, UberX for Rs.800 and Uber Black is available for Rs.1000. Invite friends and have a fun filled trip to the amusement part with Uber at surprisingly low price. Spend more at the park and less on the travel charges. Download the Uber app. Open the app and request a ride to Wonderla. Give the promo code WONDERLABLR. The offer gets activated automatically. The offer is valid in Bangalore only. Bangalore riders using the Uber app for the first time can avail the Uber 1st ride free offer. Download the Uber app – Uber Android app or the Uber app for iPad whichever is specific for your device. Register with Uber and run the application by signing at Uber. After the installation process, the app is ready to use. You can avail some more brilliant offers in different places. You can avail an amazing deal with Meru Cabs First Ride Offer which is giving a definite discount not just in one city but the entire country. To avail the offer, choose the pick-up location and the destination. Give the Uber 1st ride promo code. Hit the confirm ride request tab and your free ride is ready for you. In Chennai, Uber services include UberX and Uber SUV. Uber services are available in Chennai covering Muttukadu on ECR, Perungalathur on GST, Siruseri on OMR, Thiruvottiyur, Ambattur, Avadi, and Poonamallee. Uber provides two free rides worth Rs.200 for Chennai riders from few bars and restaurants. Ride with friends and have fun at your favorite restaurants having a shot for free. You can also fill your hunger bank by ordering food from Chennai FoodPanda food offers as well. Open the application, request a ride to your favorite bar and restaurant. After arriving at the restaurant do not forget to collect your Uber receipt and provide it at the restaurant to get your free shot. The offer is valid only at specific restaurant and bars. Riders can avail the Uber Approved benefits at the restaurant only by providing the Uber receipt. The restaurant reserves all rights to deny the offer. Uber partnered with Starwood hotels in Chennai and gave its riders an opportunity to play golf along with the celebrity Gaganjeet Bhullar, Arjun award winner. After the game, you can have a delicious brunch at AKDR Golf village. The lucky Uber riders can have all the fun for free. Ride with Uber during the offer period. Give the promo code before taking the first ride and it will remain active for the period of the offer. Winners of the contest will be intimated via email. Uber rider who takes the maximum number of rides during the contest period will win the offer. Another interesting deal offered to Chennai riders is 50% discount for four rides to and from SPI cinemas venue. By showing the Uber receipt at the ticket counter in any of the cinema venues (except Luxe) in Chennai you can get Rs.100 food voucher. You can order more food and avail food voucher as a new user on Faasos food Coupons for Chennai users and never keep yourself or your loved ones hungry. Provide the details of Uber discount coupon code in your app to avail this offer. If you are new to Uber, download the app and start using the application. At the promotions page, find the promo code for the offer and provide it at the time of requesting the ride. At the destination do not forget to take the Uber receipt. Provide the receipt at the cinema venue to obtain Rs.100 food voucher. It should be remembered that the receipt of Uber should be from the same day of visiting the cinema venue. This offer should be used alone without clubbing with other offers. The cinema premise reserves the right to reject. All conditions of the premises apply. Uber has changed the long distance fare to meet the prevailing economic conditions. As per the changed rates, Uber charges Rs.15 per kilometer for UberGo after 15 kilometers and Rs. 16 for UberX after 15 kilometers. The base price and the fare per kilometer for the first 15 kilometers are unchanged. The changed tariff plan does not include the toll charges if any. Riders have to make an extra payment for toll charges. Even though Uber has slightly increased the long distance rates, the overall price of the ride remains reasonably priced and low priced compared to the competitors. Above all, Uber services are known for their comfort, convenience and are worth the price. The best part of uber rides is, the riders can choose to make the payment with credit/debit card or using their Paytm Wallet. If you are travelling from a long distance you can take Redbus coupons and save more on your trip! So, there are many reasons to ride with Uber for all your long distance trips. In collaboration with Chennai Football club, Uber offered free rides to and from Jawaharlal Nehru Stadium during the football season to football fans to enjoy the match. Riding in Uber to the stadium is hassle-free without worrying about the traffic or the parking. However, the demand for Uber rides will be high during few hours before and after the match. Hence, it is suggested for the football fans to request their ride early and reach the stadium early to avoid last minute delays and disappointment. Give Uber experience to your guests without worrying about the parking space. Uber offers free rides to events such as store inaugurations, concerts, festivals including the corporate events. You can user Uber services for your bash even if it is in a remote location. Ubers makes it convenient and flawless for your guests to arrive at the bash. Download the Pune Event Partnerships Form from Uber site and provide all the required details. Uber marketing managers will provide a unique personalized code for a free first ride to your event. You will also be given the instructions to redeem the offer. Now, it is time for you to share the customized code and the image to your guests via email. Your guests would be delighted to enjoy the free ride and enjoy the bash. You can also share the code in social media. Uber Pune users can avail a free ride when they use the Uber app for the first time. This Uber 1st time offer for Pune user is bundled with free Wi-Fi access. So, enjoy a free ride surfing the web for free. You can also try Ola Cabs Coupon Code for Pune on your fist ride and get a free first ride! Invite your co-workers and friends who are not using the Uber services and grab a chance to enjoy free rides for the entire month. Whenever a friend of yours takes the first ride using the invite code shared by you, you and your friend will be rewarded with a free ride worth Rs.250. So, more the number of friends you refer more will be the number of free rides you will earn. You can also get a chance to win 100 free rides depending on the Uber level you reach before December 6th. Uber intern who refers 10 riders can win 10 extra rides. Uber Exec who refers 25 riders can win 25 extra rides. Similarly, Uber office hero referring 50 riders can get 50 extra rides. Download the Uber app and you will find the invite code to be shared in the Share option. Refer friends using the invite code. You can even personalize the invite code. When your friend avails the first ride you and your friend will receive free ride worth Rs.250. Free rides will be awarded to only drivers who abide by the Uber rules. Riders creating multiple accounts with the same personal email address will not be eligible for the offer. Uber suspends the account if anything suspicious such as earning the rides inappropriately is observed. Uber has announced a full week of surprises for its customers. It has included four surprises as part of the offer. The four surprises include offering PujoSUV accommodating up to six people at a base fare of just Rs.120 that is less compared to other car rental services, Uber Dhaakarriving at your doorsteps, unique experience of walking on red carpet to view the premiere of new movie, and a chance to win VIP passes for top pandals in Kolkata. With Uber Mall Rush offer Uber has given its riders a unique opportunity to ride with Uber to the shopping mall in the city and save on their shopping costs. Riders who take the Uber ride have to provide the Uber receipt at the Uber partnering premises to get the discounts. You do not have to provide any promo code or the coupons. Just flash in the receipt and get the discount. Some of the stores partnering with Uber include Aldo, Charles & Keith, Cotton World, Story and restaurants namely Cafe Mezzuna, Mainland China, Chili’s and others. You can try more food on Swiggy with coupons for Kolkata users and get exciting deals on your food. So, you will get a chance to ride comfortably, shop and eat at low rates. Uber Kolkata users can get first ride worth Rs.300 for free. New users can register with Uber, download the app and book the UberX service and get their first ride worth Rs.200 for free. There is no hidden booking charges or other charges; your first ride is absolutely free. Give the promo code UBERKOLKATA15 to avail the offer. Not only for Kolkata users Uber giving offers for new users in changarh also. Long distance rides in Hyderabad such as a ride to the airport are expensive. Uber has recently changed the fare for long distance rides for UberX and UberGo services. Uber offered a chance for the Hyderabad Uber riders to win a free Uber month. To avail the offer, the riders are required to take the Uber rides during the specified period. For every two rides taken, the rider gets one chance to participate in the contest. Start using the Uber mobile application. Tap on the promotions link and provide the Uber promo code Hyderabad. The rider has to request for the rides after giving the promo code. Winner of the contest will be notified via email after the completion of the contest time. The contest is not limited to free Uber month. Few riders can also win a chance to avail exciting offers from Jabong.com and Elite2 smartphone from Swipe. Winner of the contest can get the free rides only if he complies with the conditions. It should be noted that the free rides awarded to the winner have to be availed within 30 days of announcing the result. 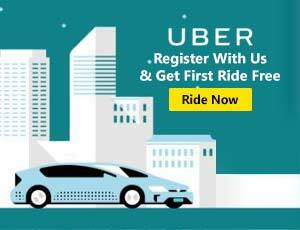 Uber that succeeded well in Hyderabad is offering exciting offers to new as well as existing users. It is providing free ride worth Rs.200 for new users. 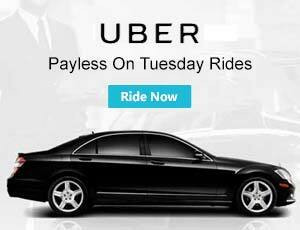 Check Uber promo code Hyderabad and provide it while booking the ride to enjoy the free ride. Check if all the details provided are correct before using the promo code as it valid for only once. New users can also travel across the city in Hyderabad by using the Meru cabs Hyderabad offers. Uber is also planning to introduce cash payments in Hyderabad to expand its customer base. Customers who wish to make cash payments should carry sufficient cash and make the payment directly to the driver-partner. Uber partnered with some of the best restaurants and bars in Hyderabad to offer its riders best discounts on food and beverages. Uber launched the Hyderabad Gourmet Week during which it gave an opportunity for its riders to have fun with friends dining at the best restaurants. Riders can avail the offer directly without providing any promo code or the coupon. Providing the Uber ride receipt from the same week will do everything. Some of the restaurants in Hyderabad partnering with Uber include Urban Asia, Via Milano, Komatose, Heart Cup, Spoil, and others. Users can also avail some exciting food deals on Foodpanda Hyderabad food Offers and keep your hunger levels down! It should be noted that conditions of the restaurant apply. The rides are required to meet the minimum bill requirements if any. The receipt has to be shown before placing the request. This offer should not be used along with other offers. Uber has made the special occasion Onam even more special for the residents of Kochi. It brought Mavelis to the doorsteps of Uber riders. Riders who made a request for the Maveli are gifted with the hampers containing the traditional Kerala Nendran Banana Chips for a small price of Rs.100. Riders can make the payment after getting the hamper by cash or make a payment directly after making the request using the credit/debit card or the Paytm Wallet. There has been a huge demand for the hampers during the festive season. Celebrate Onam with Uber and share the traditional style banana chips with friends and family members. Grab an opportunity to request a song of your choice talking to Kochi’s favorite RJ. Uber gave an opportunity to listen to the favorite music for its riders early in the morning at 9:43AM. Plan your Uber ride during that time to request a musical note of your choice. When the ride arrives at the pick-up location do not forget to ask the driver-partner to turn on the CLUB FM. Uber has introduced a new fare for long distance rides. For all rides, the long distance fare after 15 KM is fixed at a price of Rs.15 per kilometer. However, the regular fare up to 15Km is Rs.7 per kilometer. Even with the increased fares Uber rides in Kochi are affordable and comparatively low. However, the rider has to bear the extra toll charges if any. It is not just the rates; Uber is also offering convenient modes of payment for the riders. You can also avail some great discounts on Ola cabs offers for rental cars and ride your car around the city, not just a cab! Riders can make the payment by cash, credit/debit card or by using the prepaid Paytm Wallet. So, travel more with Uber and save more. Do you enjoy watching your favorite team play on the field? If yes, then ride with Uber for free to the Jawaharlal Nehru Stadium and enjoy every game. You do not have to worry about the traffic or parking hassles. Just hit the request button on your Uber mobile app and the Uber vehicle will pick you in minutes. To give its riders a better Uber experience Uber has also offered match tickets, signed merchandise and an opportunity to meet the players directly in person. To meet the players and take a selfie with them request the ride giving the appropriate promo code. If you are successful you can get the ride in just a few minutes. It should be noted that only riders from Kochi can avail the offer. So, get ready to avail the Uber offers in the next football season. Check the promotions page to know more about the available Kochi offers. Uber offered few lucky couples free passes to the Navratri Garba venue in Ahmedabad. It also offered Navratri Goodies. Uber offered professional rangoli artists and goodies to its customers on-demand this Diwali at a price of just Rs.100. To invite professional rangoli artists to your home hit the Uber app and tap on the Rangoli tab. Give your location and hit the request tab. The professional rangoli artist will arrive at your location along with some goodies offered by Grofers. Due to high demand Uber riders are requested to try the offer multiple times. This Diwali, Uber offered free ride worth Rs.500 for riders who gifted a first free Uber ride worth Rs.500 to their friends or family members using their invite code. You can claim your free ride when your friend or family member uses their free ride. Uber also offered Navratri Goodies. To avail the offer, the riders have to open the app and enter the promo code UBERGARBA2015. A secret view will be provided to the riders. users can also look for an accommodation on Oyo rooms Offers to avail the best deals on hotels and rooms.The user has to slide through the secret view to get the free passes for Navratri Garba venue and the goodies. Uber committed to serving the community in which it operates takes the initiative to collect and offer donations to the needy. On special occasions such as Republic Day, Uber operates a vehicle to collect donations from its customers. It donates the obtained contributions to various charity organizations across Chandigarh. Take pleasure of drinks and food at discounted price in some of the fine restaurants of Chandigarh by riding with Uber. While you take a ride along the city in your uber cab, you can enjoy the food as well. Order food on Foodpanda Coupons and gulp down your food with saving sin your pockets! By partnering with well-known restaurants and bars in Chandigarh, Uber is offering exciting deals for its customers. To avail the offer, riders have to use Uber services to reach the restaurant or bar and provide the Uber receipt at the restaurant or bar. It should be noted that the riders have to provide the receipt before placing the order. The offer has to be used without clubbing with other offers. New users of Uber can get heavy discount on their first ride. To avail the offer, riders have to choose UberGo class of cars. Download the application, and open your account. Choose the destination and pick-up locations and enter the Uber new user promo code to get the discount on your first ride. The offer gets activated automatically when you hit the request UberGo ride button. The car will arrive in less than fifteen minutes of requesting the ride. With this offer, Chandigarh riders can ride free of cost for about one week. However, the number of free rides and the charge per ride is limited. Check your promotions page in the app to know more about the offer. You can even refer your friend for this offer. It should be noted that riders have to pay the extra cost if the ride cost exceeds the specified free fare. Uber slashed UberX and UberGo prices in Chandigarh by up to 35%. Now you can ride for low prices without searching for Uber discount coupons or looking forward to free referral rides. With the reduced price, the base price of UberGo is Rs.20 and UberX is Rs.25. The fares are very low compared to other taxi services and the auto fares. Split fare with friends and you can save even more. What are you waiting for? Start using the Uber app and ride at ease paying less. Enjoy a luxurious ride with your valentine on the Valentine’s Day. Request for UberLUX services and you can get a ride in world-class Mercedes-BenzS-classes or a BMW 5-series of cars. Download the application. Choose the pick-up and destination locations. Select the UberLUX option and tap the request ride button. You can avail the service if available. There are limited numbers of UberLUX cars. Hence, riders are requested to try the offer multiple times. New users can get a great discount on their UberLUX ride. Users who do not have a valentine can also avail the offer by riding with their friends. It is just simple, refer a friend and get a free ride. To make its rides even more comfortable and affordable for its different customer groups, Uber has introduced option to make payments by cash. That’s right – when you book the cab using the Uber app choose the CASH option, take the ride and pay the driver in cash after reaching the destination. The best part of uber rides is, the riders can choose to make the payment with credit/debit card or using their Paytm Wallet. So, there are many reasons to ride with Uber for all your long distance trips. 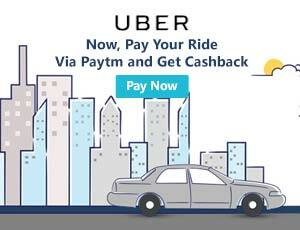 Uber collaborating with Paytm is offering wonderful deals for riders linking their Uber account to Paytm wallet. Link your Paytm Wallet to your Uber account and you will be eligible for Uber 5 free rides worth up to Rs.300 each. The offer is valid on all Uber types of services. Uber entered the Indian market in the year 2013. In a very short period of its entry into the Indian market, Uber became a strong competitor to the existing cab services due to its effective fares and deals. Enjoy the safe Uber Ride for free for the first time. Guwahati Uber users can get first ride worth Rs. 200 free of cost. UberGo services in Guwahati are cheaper compared to other taxi services. Download the Uber application and sign-up with Uber. In the promotions section, you can find the first free ride code. Provide the code while requesting the ride to avail the free ride. Make sure that pick up location and the destination are exactly specified as the Uber first free ride code is valid only once. New to Uber then you can win a free ride worth Rs.200. To avail the offer, download the Uber application. Find promo code in promotions page and use it during the booking of the Uber ride. Download the Uber iPad app or the Android app for your device. Open the application. Set the pick-up location and destination. Give the promo code HALDIRAMS to win the free ride worth Rs.200. The offer is valid only for new users who give all the required information. The offer is valid only once. Riders who register multiple times with the same personal email address cannot avail the offer. Uber account of such riders will be suspended. You can win even more free rides by referring your friends. Uber announces referral offers to give its riders more free rides. Check the promotions page to know more about the existing offers. New users to Uber can get Rs.150 off on their first three rides by providing the promo code UberUWOBG. That’s right you can enjoy three rides at a low price. Download the application and start the application. Give the promo code UberUWOBG at the promotions page. Now request the ride by giving the pick-up and destination locations. Check for the validity of the offer before giving the promo code. Ride free for the entire month touring around the city. Wondering how? Uber offered free rides to its users for referring their friends and family. Use your personalized code to refer friends and family members. Whenever they use the free ride you will be given a free ride. Riders who attain the targets can attain extra free rides of up to 100 rides. Uber riders can grab a chance to win 10, 25, or 50 extra rides by making 10, 25 or 50 successful referrals. Users who are new to Uber can win 2 free Uber rides by giving the promo code UberShott.To avail the offer, users have to download the Uber app for Android or Uber app for iPad specific to their device. Register with Uber, run the application and install it. Open the application and tap the promotions section to find the free offer. Choose the pick-up location and the destination points. Give the Uber 1st time promo code and hit the request ride tab to claim your free ride. If you have any queries email your queries to the Uber Surat support center. Mysore Uber users can get a first ride worth Rs.200 for free. Give the Uber 1st time promo code specific for Mysore users and get 200Rs off on your first ride. To save more choose UberGo services. Uber in collaboration with Young Indians took the initiative to donate to the unprivileged children all the items they need such as clothing, stationery, textbooks, backpacks, and others on behalf of its users. It has taken all the pains of collecting and donating them to the needy. Uber Nashik users are being offered flat Rs.200 off on their first Uber ride. Give the Uber first ride free coupon code RWNASHIK when you book the Uber cab to avail the offer. Uber Visakhapatnam users can get a flat discount of Rs.400 on their first ride. Uber 400 off promo code can be obtained. So, start using the app, book a cab and enjoy a free ride. Make a request for Uber ride. If you are new to Uber give the Promo code SELFIEWITHUBER and avail a free ride worth Rs. 300. When the Uber ride is at your pick up location take a selfie along with the vehicle and the driver partner. Upload the picture at Uber website. The Image gets posted in the Uber website. Share the link with your friends and family. The selfie that gets a maximum number of likes will grab the cash prize. Uber Technologies Inc. established by Travis Klanick and Garrett Camp in 2009 provides transportation services globally in 67 countries and 300 cities. It has designed an application that connects the riders with drivers efficiently without any hassles. The company that began its operations locally in San Francisco expanded to other cities of United States and to the International market in a very short time period. Designing easy to use application, the practice of unique business model and strategic marketing methods are secrets behind the success of the company. Uber debuted into Indian market targeting Bangalore and gradually expanded to other cities of India. Currently, 22 Indian cities are enjoying Uber services. Its fleet of cars includes UberX, UberGo, and UberSUV. Pricing range of the cars vary depending on the comfort offered and the number of riders the car accommodates. UberGo services are the cheapest while UberSUV is the most expensive. Uber introduces interesting offers time to time depending on the local demands making its rides affordable. It makes its presence during special occasions such as sports events, festivals, and movie premiere shows. The best part of the Uber rides is that the professional driver-partners arrive at the pick-up location within minutes of placing the ride request. It also offers convenient payment methods. So, Start Ubering and save more. Uber Technologies Inc. is an international transportation company founded by two Americans Travis Kalanick and Garrett Camp in 2009. The beta version of Uber app that lets you hire a cab at just the click of a button was introduced by Uber Technologies Inc. in 2010 for the comfort of its customers. The app was officially released into the market in the year 2011 in San Francisco. Transportation services were initially limited to the United States. The company gradually began expanding its services across the globe since 2012. As reported in May 2015, the company operates in 67 countries and nearly 300 cities globally. How to Pay Cash in Uber Rides? Open the app and click on ‘Set pickup location’. Change the existing payment method to Cash. Now, click ‘Request a Trip’ and you are ride is ready to use. After you reach the destination pay cash to the driver. Ride fare will be displayed to you as well as the driver. It is very simple, no hassles, no booking cost or additional costs. Is First Uber Ride Free? Yes, it’s true. Uber gives out free cab rides for first-time users. Uber has a name for being reliable and affordable at the same time and that’s why free rides are offered to first timers to show them how good these services are. To get your first ride, simply click on the download option on your mobile device and install the app on it. Furthermore, register yourself on the app and once your registration is complete you can use this free ride whenever you want and get the full user experience of Uber. So why the delay? Download now and enjoy the services. How to Get Free Rides in Uber? Winning the free rides is simple. Just refer your non-ubering friends and family members. More the number of friends you refer more the number of free rides you win. You will be eligible to win the free ride when the friend that you have referred uses the first ride free offer. The Uber level you achieve determines the number of free rides you can win. I’m Existing user in uber, is there any discount promo codes for existing users? Yes, Uber offering discounts for existing users also. Use this UBHYJ5QA4 coupons to get 25% discount on your next 5 rides, but this is applicable for Hyderabad users only. Hi blogger ! I read your posts everyday and i must say you have high quality articles here. Your blog deserves to go viral. You need initial boost only.